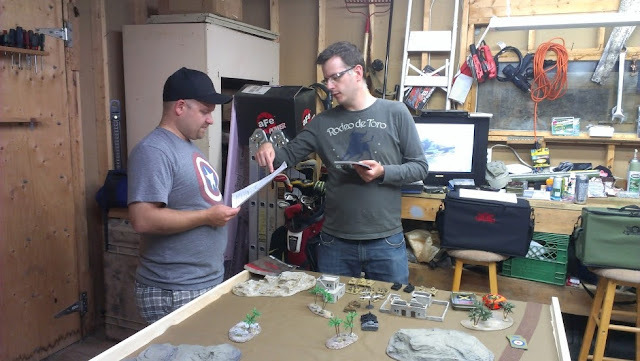 A few weeks ago during Friday Night Fights, there was some discussion about my gaming table and a few of the guys thought it would be good to turn my modular table into a 'how-to' type post for the blog. I took some video and some pictures, so everything you are about to see is easy to do and best of all, CHEAP!! I think I ended up spending maybe $40 for all the wood and the legs for this project. Feel free to leave any questions you may have and I hope a few of you build your own table to use with your mates on your next gaming night! Lay everything out on the floor so you have all the edges lined up and the table ends are FLUSH. I left the center MDF board out so you can see how it should look before you start putting everything together. 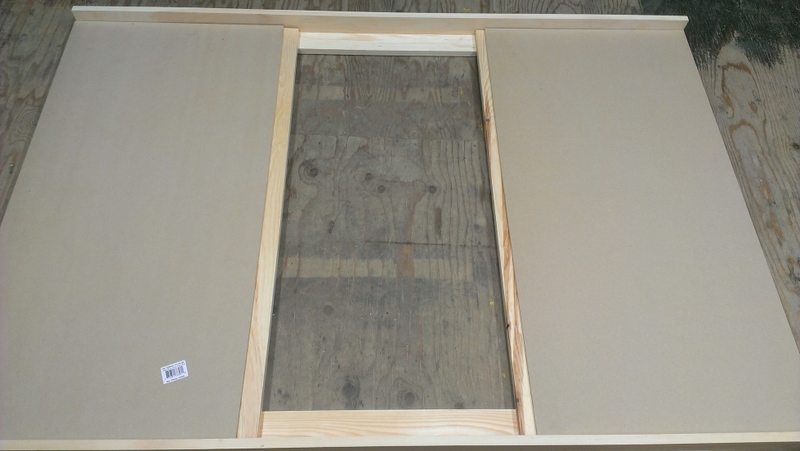 Once you have that, take one of the 1"x3"x6' pieces and put glue all the way down the one side as shown in the picture above. Line up the edges of the 1"x4"x6' piece and ensure they are flush before you clamp them in place. 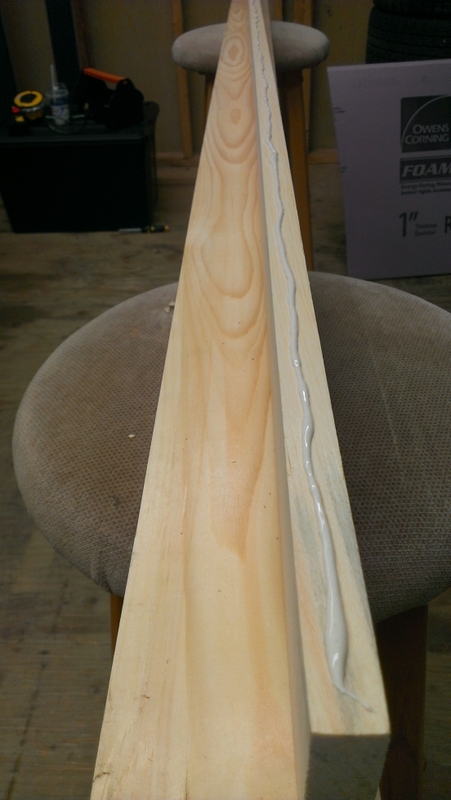 Once you have them glued and clamped in place, let them dry for a few hours or as directed by the wood glue you used. I did mine late the night before I built the rest of the table. Go play some World of Tanks or muck about on EasyArmy to kill time! 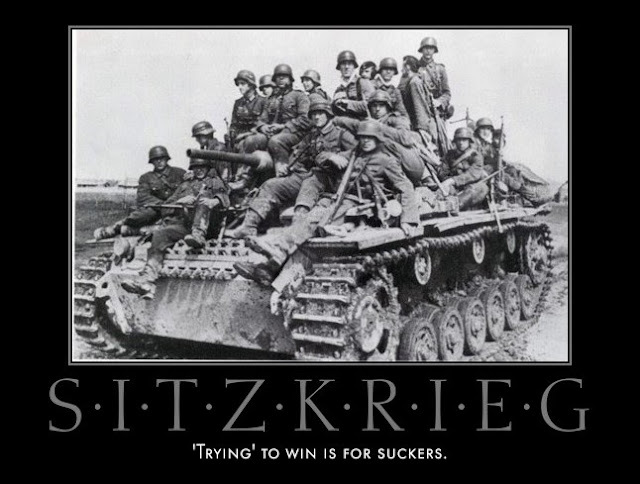 While I can not take credit for the term, 'Sitzkrieg' is a new word that defines a not so new tactic, being employed by mostly infantry based lists in order to win games. These missions are usually the ones where the defender literally has to sit tight for 6 or less than 6 turns while playing out the clock in order to secure an easy victory. While I see the two sides of this dilemma, I can not help but think that sometimes it is on the attacker to simply do what he or she is supposed to do when facing dug in infantry....and that is simply ATTACK! It's too easy to look across the table a lot of the time and think that all is lost. 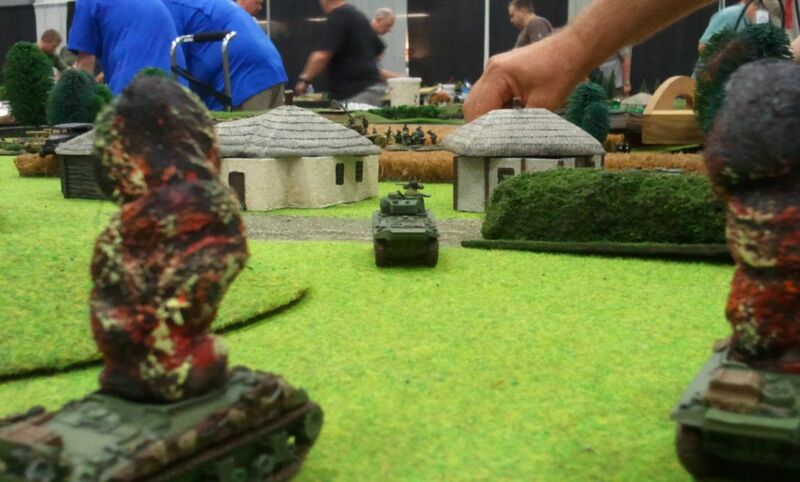 You have to find a way to dig out Veteran infantry when you are in a tournament. It's a fact that you have to deal with and comes down to aggression and tactics. 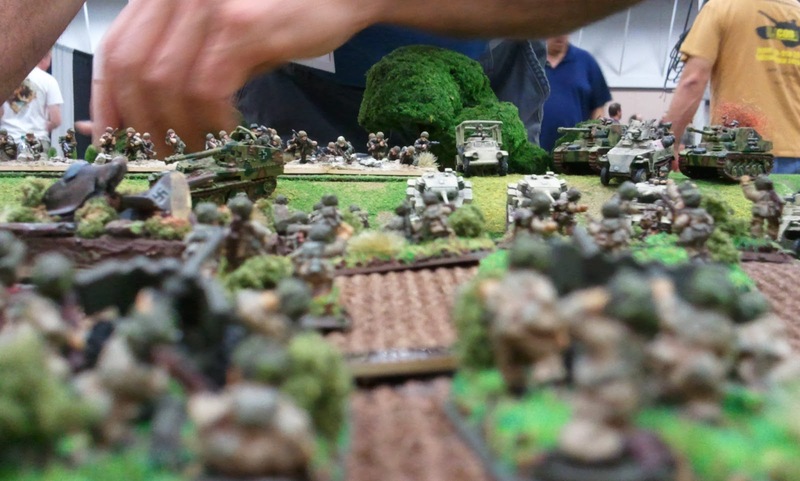 I am, by no means an expert at Flames of War, but over the course of Historicon and countless games afterwards, I am slowly gaining confidence of simply giving it all that I have to secure a win. Granted, my 82nd Airborne list falls into the 'Sitzkrieg' stereotype, but I have also been on the other end and have had to attack more than defend with this list. Most of those games I did lose, not because I was unlucky. 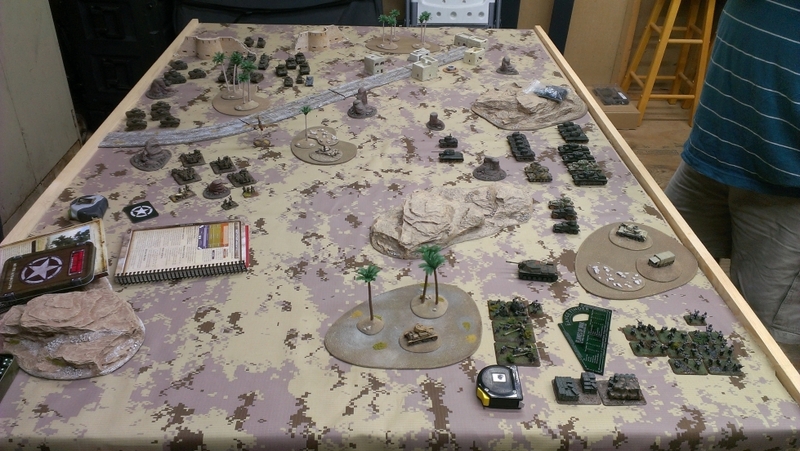 I lost most of those games because I failed to use the rest of my army's assets to their strengths. If you saw my game against Steve Wagner's Panzergrenadiers, I now know that in some cases, shooting some smoke at targets in order to advance my troops would have likely won me that game. In the very least, would have given me a better shot against losing it. What do you think of the new tops? 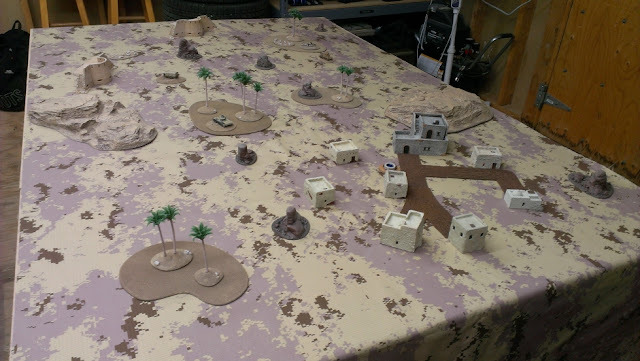 I trimmed the desert one a little too much, but it doesn't really show on the table I built. 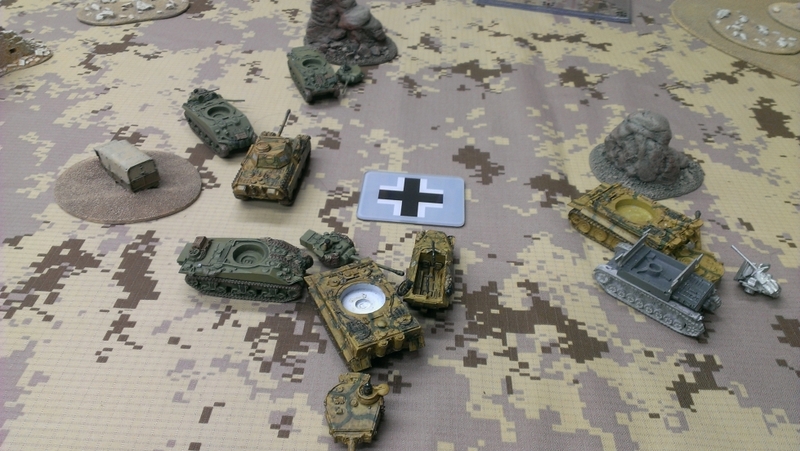 The other camo pattern looks a little 'busy' without terrain on it, but once you add some buildings and roads, it comes off being pretty nice and a lot more interesting than the green game mat I have. While the desert material is a little tougher, the one below is a little stretchy, I might stretch it over the 2'x4' 1/4" MDF boards that I use. Then they are permanently setup and can be placed on my modular gaming table, or the spare six foot table I use for when we have two games. I don't host very often, but lately people have been willing to come out and play in my workshop. It's slowly becoming a hideaway to get out of the house and roll some dice. I have a small TV setup in there on my workbench for movies, and my beer fridge is only a short walk to the side door of my basement. The way my house is built, this setup offers a little more room for two tables believe it or not. Weekday game vs. Scotty. 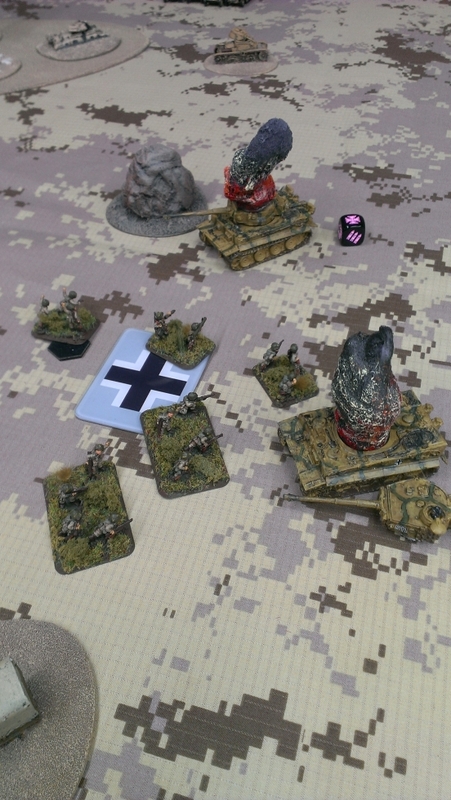 My Germans against his 11th Armored. Panzer IV's pressing the center of the table! Panzer IV Commander rolls by two of his victims to secure the objective! It was pretty nice to play two games this week. 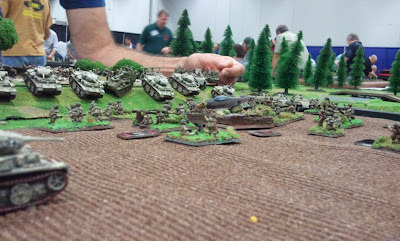 The first I played against Scotty's 11th armored, and he gave me a run for my money. All in all, it was a fun game that went down to 10 minutes left on the clock and I came out on top to win. 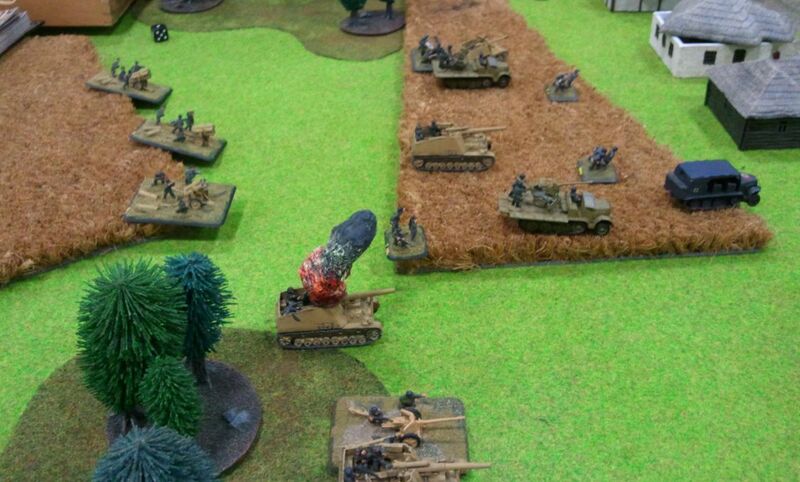 He was a little irritated to find I had Tiger's in my list and Panzer IV's to back them up. 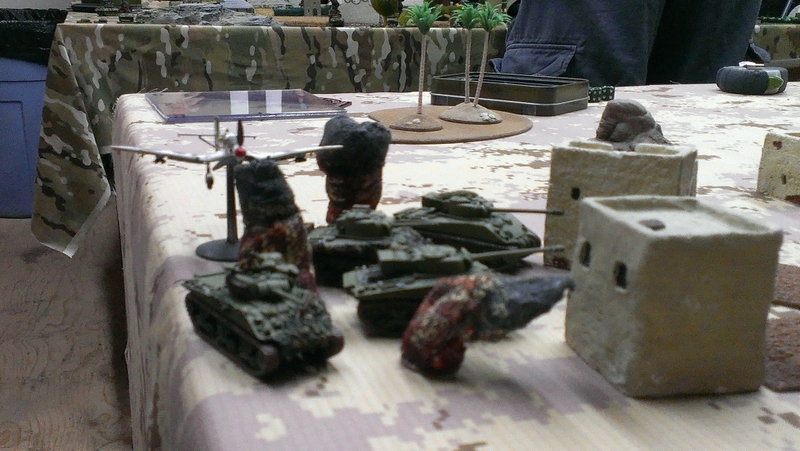 He used arty, Firefly's and a clever M-10 ambush to dispose of my Tiger Commander on the first turn!! 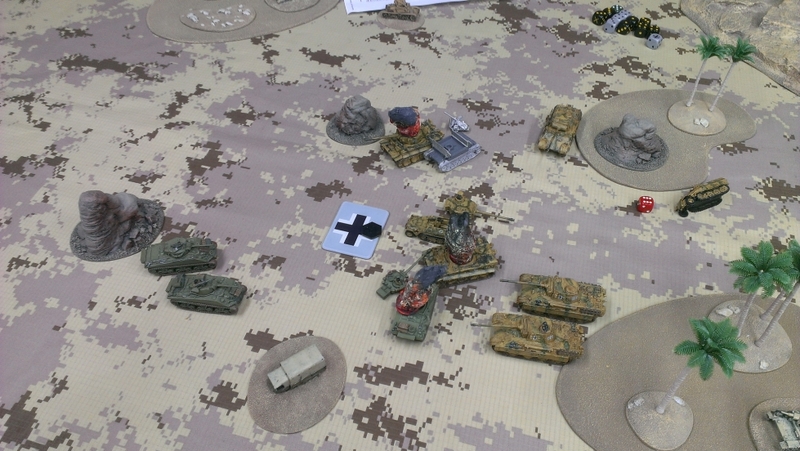 So, for the rest of the game he had to cruise around in a Panzer IV. 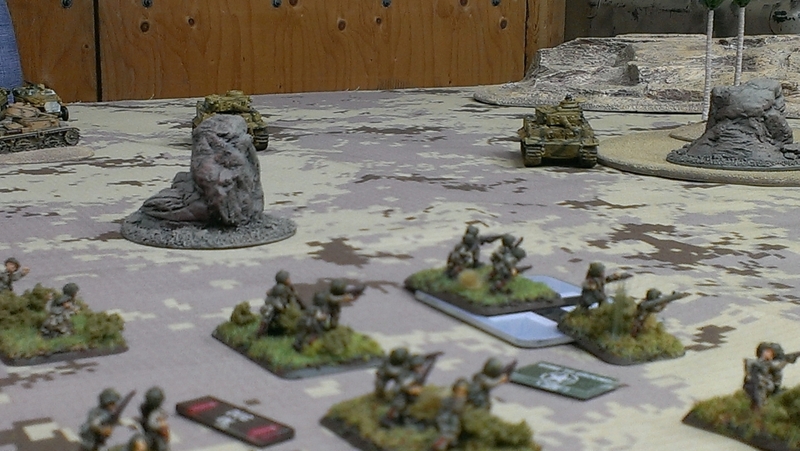 The more I look at my Panzer IV's the more I dislike how they are painted. 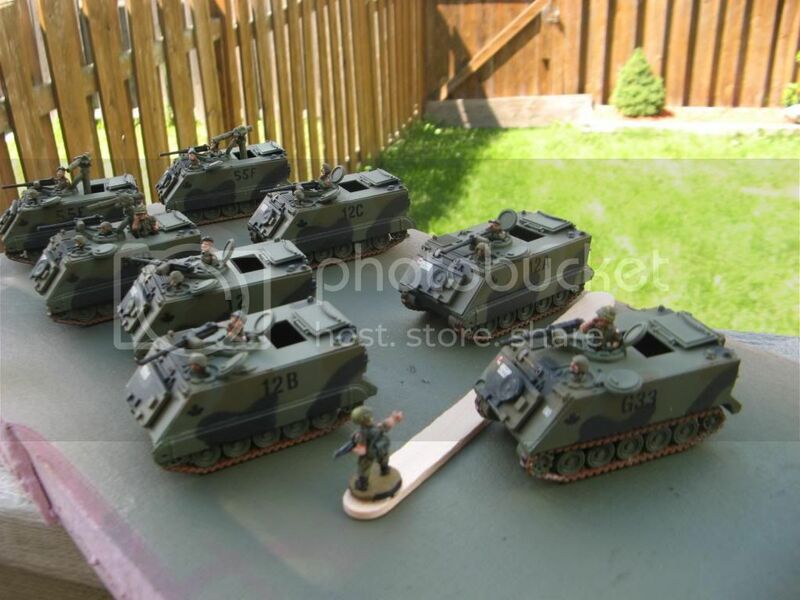 I got some PSC Panzer IV's a LONG while back so I could make a decent Panzergrenadiers list with them. It was also a time where I was not painting that much. Look for them to get a touch up! 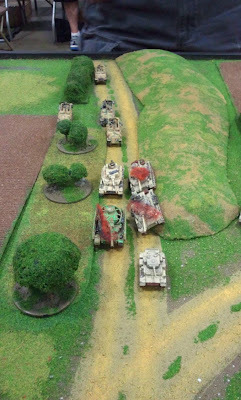 Tigers roll into the 82nd's defenses. 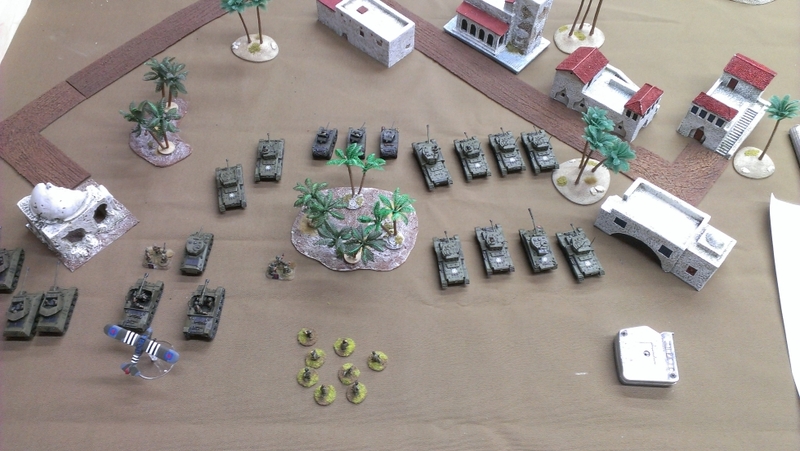 Counter Assault!! 82nd knock out two Tigers!! 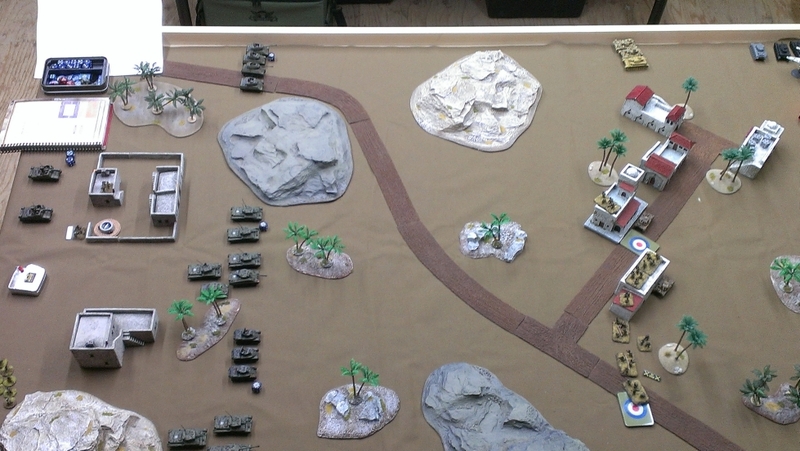 My second game and the one I had the most fun playing was against Duane. We rolled up Dust Up I think, and it played to time and Duane came away with the win. We were back and forth for a while and in the end, I ran out of armor and he was able to take the center objective to secure the victory. We each took heavy losses. He lost his 'King' Tiger on the North Eastern objective, I made a push with Fireflys and Shermans, but could not dig out his infantry without taking on a few of his Panther tanks as well. I had to choose, I chose to try and kill the armor first. 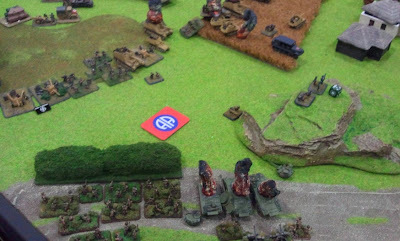 I did that with four shots on his second last Panther, Duane had one on the center objective and if he got to his turn, then he wins. I had a last ditch effort to break his Company morale. His IC was dead, so I hit one of the two Panthers with long range Firefly shots. I missed with the first two shots, but re-rolled because I was outside 16" for Indirect Fire. I hit both shots, he saved one and the other one I had a chance to 'pop' him. No dice, only bailed him out. 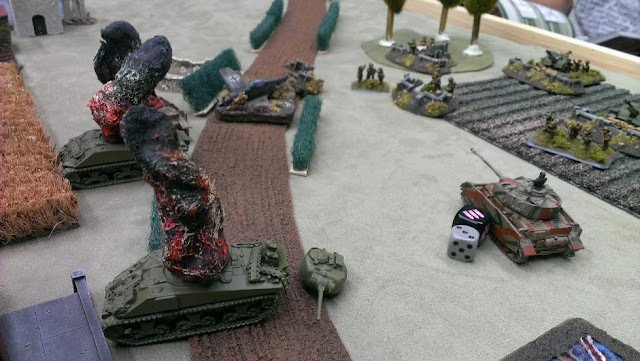 All was not lost, in the Assault Step I decided to leave the safety of my foxholes and took out his bailed Panther. He needed to pass a test, he did. Duane's turn, he wins. At least it was close! The game ended, was a 3-4 loss. 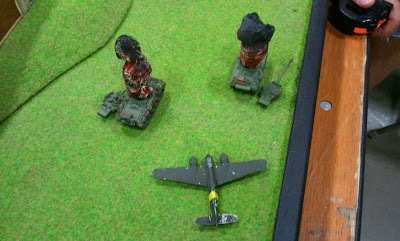 Three bombs fall, narrowly missing their targets!! The Germans push for the center! 82nd Airborne reserves arrive, making a push in the face of MG fire! 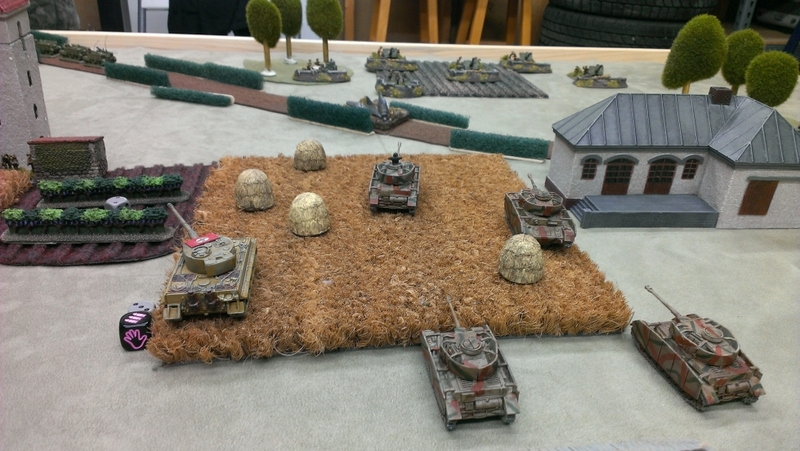 Stalled British armor, move in slowly as to expose themselves to Panther fire! 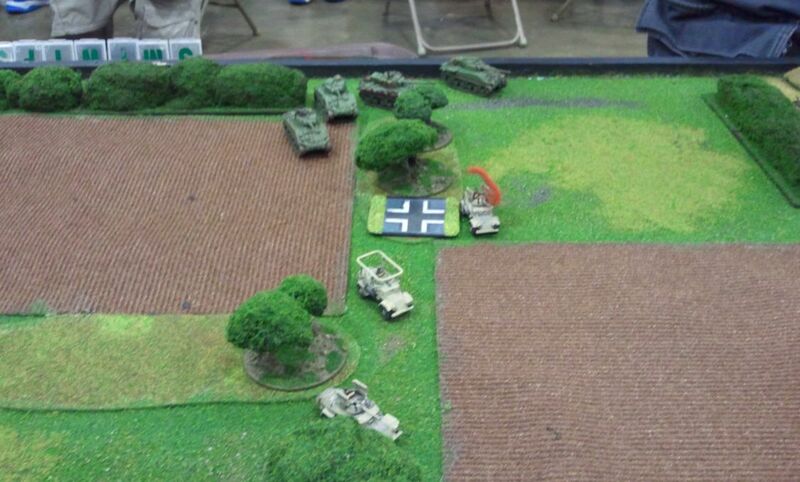 The lone Panzerkampfwagen V sits on the objective for the win! Trying to get in as many games as possible has been difficult as of late. With all the Historicon prep time, I missed out on the bulk of the campaign. I tried to get some more bat reps in with my doubles partner, but had issues with the reports being submitted twice. So here are two solo reports on games that I played at Historicon against the only two Axis opponents I had during the event. The club will likely get together this Friday and get some more games in so we can do some more write ups if required. The mission was simple, the layout did not leave me many options to attack without getting hammered each turn by arty or air attack. 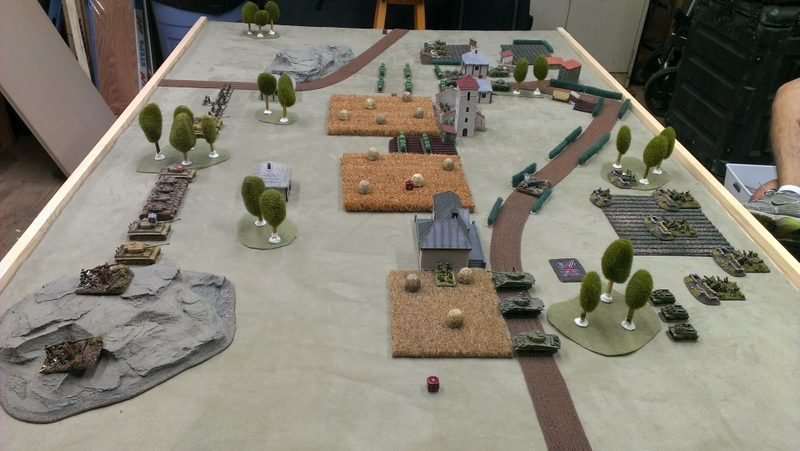 The only option in the early going, was to leave the woods and move towards the objective I placed on the bottom part of the deployment area. I drove my armor alongside to support the infantry, yet lost one to artillery fire in the process. To the north, the 82nd attempted to swing around the side and give the Germans something else to shoot at. They did better than expected and inflicted more wounds to the incoming Americans! 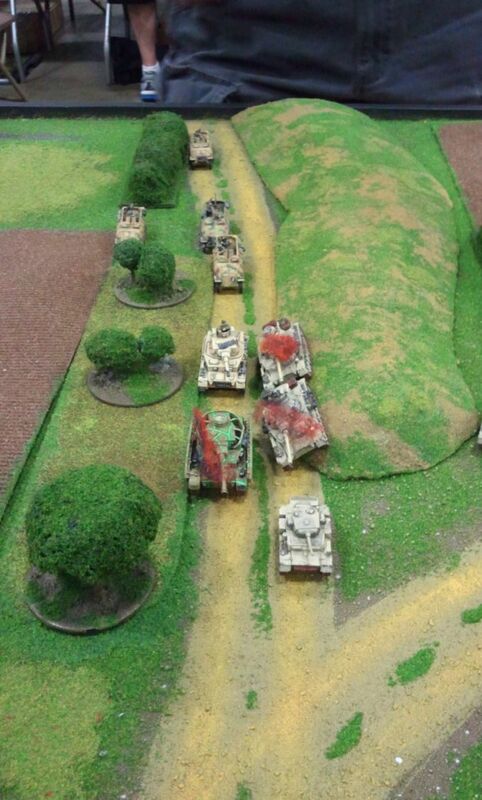 Here you see the second platoon of tanks laying in waste as their commander continues to drive forward!! 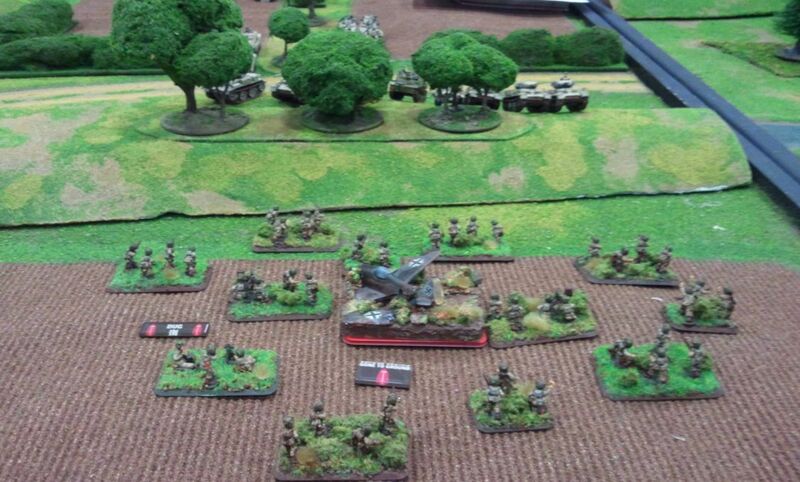 Consistent air attack was key if the Germans were to hold and secure the win. In the late stages, the Americans finally inflicted a casualty. Some long range shots from my Firefly's were able to knock out this Hummel. 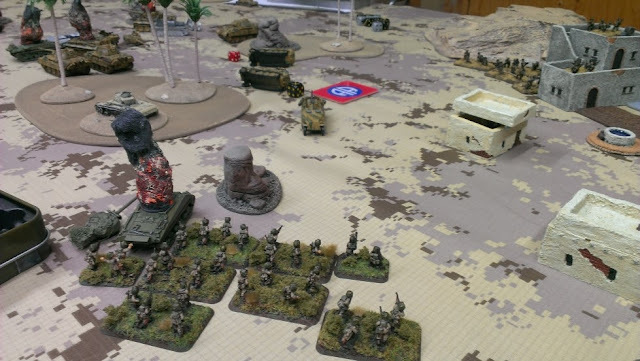 Steve sprang his Pak-40 ambush and destroyed the remaining armor platoon that was supposed to be supporting my push to the objective. By this time, we were down to only a turn or two until TIME was called. 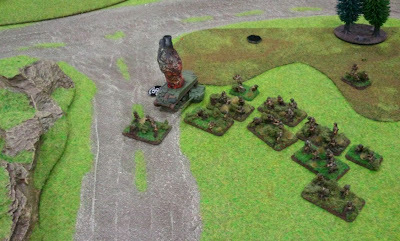 The end result on turn 5, was being only inches from the objective, but Steve was able to close to 4" as well with his infantry protruding from the relative safety of the woods. I really could have done better in this game had I simply smoked his AT guns and take the risk of simply over running the objective a little earlier, before he could re-act to my movements. I was simply overwhelmed by 10 German platoons of opposition and not playing the 82nd Airborne as they deserve to be played. Speed and violence of action would have given me a different result. In this case, it was a 1-6 loss. 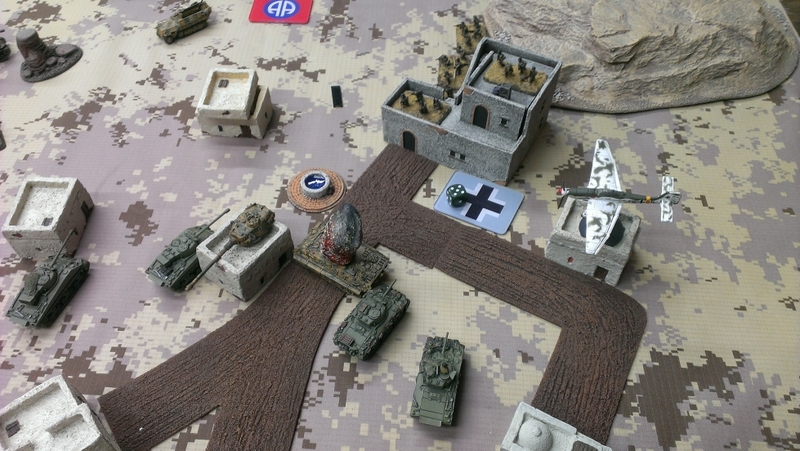 Expecting a massive counter attack, the 82nd Airborne dig in one objective, they lie in wait as their reserves try and take the German objective to their North-West. Early in this game, the P-47 air support was able to track and target an advancing column of Panzer IV tanks. All but one of the Huns' tanks were destroyed in the bombing attack. 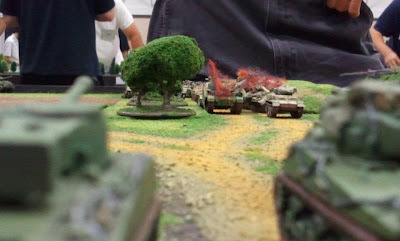 The armored Guards platoon looks down the road and ready themselves to lay waste to any enemy tanks that attempt to drive towards the left flank. 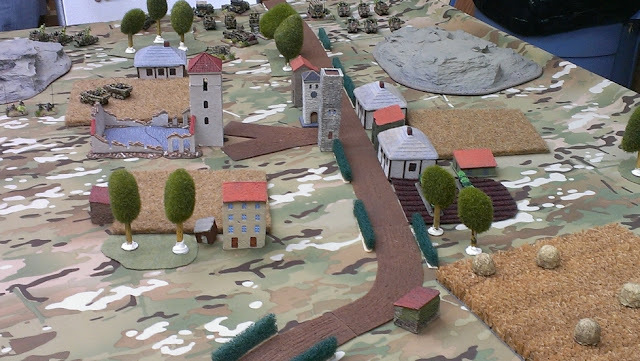 At this moment in time, I was only a turn or tow away from reserves, where I would make the Germans force themselves into making a choice to defend an objective with a small Recce platoon and attempt to over run the 82nd's position on the other side of the hill. The Germans came over the hill in mass and attempted to rout the Americans! Looking at this while I took pictures, I definitely felt a little overwhelmed and for sure thought all had been lost, the 82nd would have to give ground back to the Germans. I was able to bring my armor from the left flank and my 57mm Anti-Tank platoon acted as a great deterrent to make the enemy think twice before charging in their with all his armor. The Marders and Luchs of the 'Spah company certainly came over the hills in numbers, but quickly their numbers fell to Anti-Tank, bazooka and long range shots from my armored platoon. The end result of this game, if you caught the video in a previous post was 4-3 for the Americans.